15 Amazing Tiny Kitchen Ideas - Amazing Design Solutions! Looking for creative ways to make better use of a small kitchen? In today’s article we recommend some amazing space saving tools and storage ideas that won’t break the bank. You’ll be amazed at some of these modern pieces of design. The kitchen is often a favorite room in the home. It’s the place where smells evoke memories, and time can be spent making the things that we love. Life in a smaller home doesn’t meaning compromising on these experiences either. With some clever use of space, a small kitchen can be an equally welcoming and pleasant place to spend time. The key is to make use of the “dead” spaces that are ignored when space is not at such a premium. By making clever use of the spaces behind doors, the undersides of cupboards, and the spaces between units for example, the lack of drawers doesn’t even have to be an issue. Small kitchen storage ideas are sometimes so obvious you’ll wonder how you never thought of them yourself. Furthermore, there are some really smart designers out there who base their ideas around this exact problem. 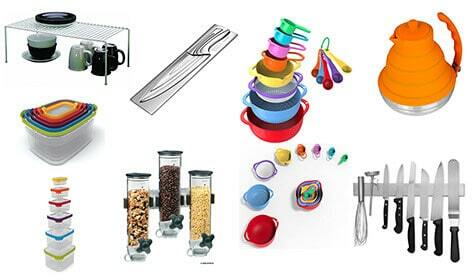 Their ranges of innovative kitchen utensils and tools are made with functionality and storage space in mind. It’s now possible to significantly reduce the amount of space that kitchen utensils take up, but completely retain their functionality and ease of use in the kitchen. In this post we recommend our favorite space saving kitchen utensils. These are utensils that feature some amazing design ideas that will allow you to declutter and downsize your kitchen, but keep all your favorite tools. Following the utensils we’ll also list some awesome storage space ideas, that can transform your small kitchen. There’s everything from kettles, bowls, and colanders, to spice jars and storage ideas. Some of the design ideas are just amazing, and you’ll wonder how you’ve been without them for so long. In the first part of our guide to kitchen ideas for small houses, we look at some of the most creative tools and utensils. These are our favorite tiny house kitchen ideas, and they’re available right now. What better way to start our list than with a collapsible kettle! This is a really cool piece of design that makes use of a flexible silicone body. After you’ve boiled the water, simply flatten the kettle and store away. Your once large kettle is now just a few inches tall. The 40-ounce (5 cup) capacity kettle can be used on gas and electric stove tops, with the heated kettle-bottom made of stainless steel. I hope you like bright colors though, as it comes in a choice of bright green, orange, and blue. The blue is our favorite, and it would be a better fit for most kitchens. This is an amazing idea that makes organizing small house kitchens that bit easier. Just think of the surface space you can save with one of these. Who would ever think you could keep your kettle in a drawer? This is such a smart idea that you wonder how it’s not more common in homes. 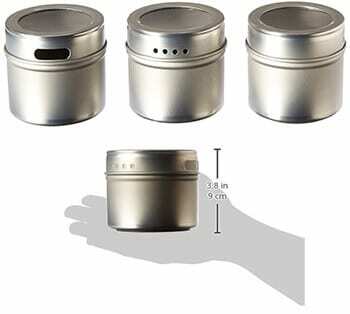 These Kamenstein Spice Tins have a magnetic backing, which allows them to attach to any flat metal surface in a tiny house kitchen. That means most appliances, as well as refrigerator doors are now areas for storage! The attractive storage jars have twist-top lids that give the options to sprinkle or pour. The tops of the lids are clear so that the contents can be easily and quickly identified. They hold up to three ounces of spice (or whatever you need to store). In fact, these would be a helpful addition to the office workspace too. They could easily store pens and pencils, and leave your desk area free from clutter. They come in sets of 3, 6, or 9, and are attractively priced too. This customizable space saving dish rack from Full Circle can save some serious space on the counter. 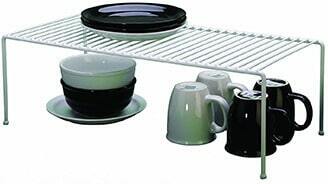 When in dish rack mode, it has an adjustable layout so that you can change it to fit dishes, bowls, and pots. It also has sloped sides to aid drainage, and a silicone stopper helps to prevent messes. When the hard work is finished and the dishes are put away, this clever dish rack can be folded up to take up just 3″ x 8″ x 16.4″ of space. This really is one of the best small kitchen storage ideas, and the perfect addition to any tiny house. It comes in a choice of green or graphite colors, and it even uses a wood fiber composition that reduces the use of plastic by up to 20%. This is one of the top space saving dish racks out there. It’s well designed and smartly priced too. 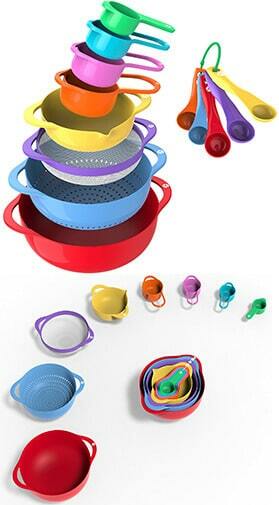 This colorful mixing bowl set from Vremi has everything you need to fulfill your baking needs. There are 4 prep and mixing bowls (including a colander and mesh strainer), 4 measuring cups, and 5 measuring spoons. Utensil storage ideas are sometimes so simple, but they are stylish too. The whole set packs away like Russian dolls to fit inside the largest (4 liter) bowl. The set is dishwasher safe and made from BPA free (non-toxic) plastic. The bowls and spoons are colorful and lightweight, but remain strong. They’re great for teaching kids how to bake too. A tiny kitchen doesn’t mean no baking! The set is labeled with both metric and US measuring scales. This over-the-sink cutting board has a built-in collapsible colander too. Not every kitchen might have counter space, but every kitchen has a sink. This clever design extends the counter top to the sink, as this cutting board sits perfectly atop it. The cutting board is extendable to an extra long size, which means it will fit most kitchen sinks. The edges are coated in silicone so that it won’t slip, and gives a really sturdy base to work on. 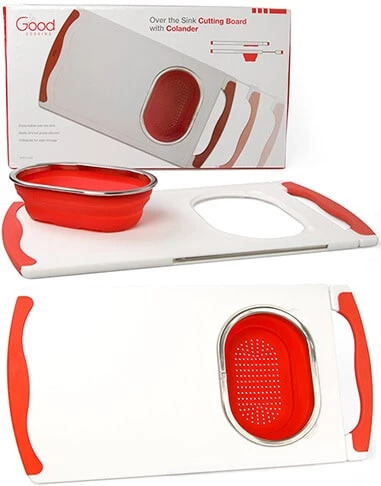 It includes a colander that is removable and also collapsible for easy storage. It is made from 100% BPA free food grade polypropylene and silicone that is dishwasher safe and easy to clean. This knife set from Deglon manages to tick the box for having a compact and space saving design, but managing to remain really stylish at the same time. The knives are practical and durable, but will be a conversation starter at the same time. 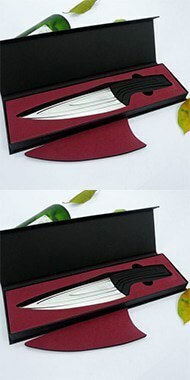 The set of 4 knives and case fit together beautifully to take up next to no space in the kitchen. The knives are made of a high quality stainless steel and the set includes a 3.25″ paring knife, a 5.25″ utility knife, an 8″ chef’s knife, and a 8.75″ slicer. They all fit together inside a matching case. This is a quality knife set, and Deglon offer a lifetime warranty to safeguard your purchase. This knife set looks so good that it will make even the worst of us cooks seem like we know what we are doing in the kitchen. 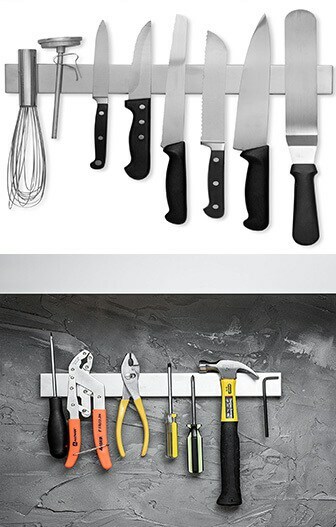 Staying on the subject of kitchen knives, this magnetic knife strip is an awesome idea to help keep your small kitchen organization on point. The magnetic strip is designed to carry the weight of even the heaviest of kitchen knives. In fact, it isn’t just for the kitchen and can be used throughout the house to hold metal items. Tools, keys, toys, it can be a great organizer in any room. The magnet is high quality and will last for years and years. The strip is really easily installed in just 10 minutes, and will give you even more counter space with which to work. It measures 16 inches in length. Besides saving lots of room in the kitchen, it is also much more hygienic than using a knife block to store knives in. 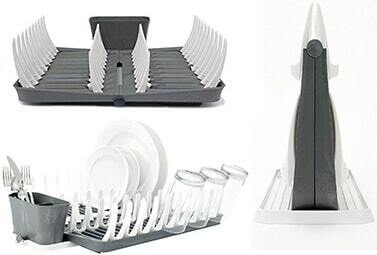 The magnetic strip can be so easily cleaned, while a knife block is really impractical and can be quite unhygienic. We think it looks great too, and it’s sure to impress friends and family. This is one of our favorite small house storage ideas. 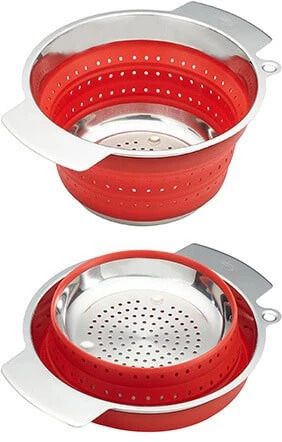 This high quality colander saves cupboard space by collapsing to less than 1/2 of its previous size. The colander is made from 18/10 stainless steel and food grade silicone. These materials are dishwasher safe and heat resistant to 392 degrees Fahrenheit. The colander is German designed and made which means it’s going to last for a long time. However, it does come with a lifetime guarantee too. The colander’s folding mechanism is patented. It is clever in that when folded, all surfaces will still remain exposed so that they are easily cleaned. It comes in a variety of sizes and colors to suit any kitchen. Collapsible kitchen utensils are becoming more popular now as the necessary materials become more affordable and of a higher quality. They are especially popular in small house kitchens. Next, are our space saving ideas for small kitchens. Tiny house kitchens can be just as functional as large ones with the right use of space. These are the best small kitchen ideas that we found. The Simplehuman Trash Can solves the problem of having an unsightly and space consuming trash can in your small kitchen. It can either hang on the inside of a cabinet door so that it provides easy access when you are cooking, or it can be mounted permanently on the cabinet door. The bucket is held in a heavy duty steel frame. The bucket is then easily lifted out of the frame when it needs emptying or cleaning. The frame is easily attached to a surface using screws. The bucket itself has a lid to prevent odors from escaping. The bucket can be lined with Simplehuman trash bags that are designed to fit perfectly with this bucket, but regular trash bags will fit too. It has a new 5-year warranty, so you can be assured that your purchase is protected. This trash can is a great way to free up a bit more floor space in tiny house kitchens. On the fence about a small freezer for your kitchen? Check out our guide to the top mini freezers on the market. This patented paper towel holder can be mounted vertically or horizontally on a wall or cabinet door. It features clever Perfect Tear Technology that prevents the roll from unraveling. By using one hand, just one piece of paper towel can be removed easily each time. It is designed to fit any size of paper towel, even extra large sizes. The paper towel holder is easily slid on and off the holder when it comes time to change. It comes with all the necessary mounting hardware, and installation is straightforward. This paper towel holder is perfect for that rarely used space on the underside of a cabinet. It comes highly recommended by many happy customers on Amazon. This isn’t the first product from Joseph Joseph to feature in this article, as they have designed some awesome creations. This 12-piece storage container set neatly packs away inside the largest container. No cupboard space will be going to waste when these containers are part of your kitchen equipment. The set is made from BPA free plastic and is freezer, dishwasher, and microwave proof. 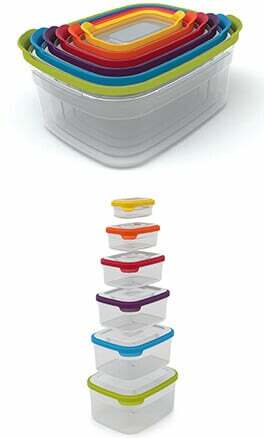 Each container is color-coded so that you can find the lid or container that you need very easily. The lids form an airtight seal to keep your food fresh. The set we have featured includes 8, 18, 37, 63, 101, and 152-ounce containers. Different configurations of container sizes and numbers are also available. If cupboard space is at a premium in your kitchen then these containers could make a real difference. This is another great idea that would fit into any home really. These food dispensers serve to make an effective use of space, and also to reduce waste and save money by controlling portion sizes. We think they look great too. The clear canister food dispensers can be wall mounted or used with a holder for the countertop. They come in sets of 3 x 13-ounce containers, but can also be purchased individually. They feature a portion control knob that dispenses around one ounce of food with each turn. The food is dispensed into a measuring cup (included) so that you always get the perfect amount. The food dispensers form an airtight seal to help prevent food going stale. 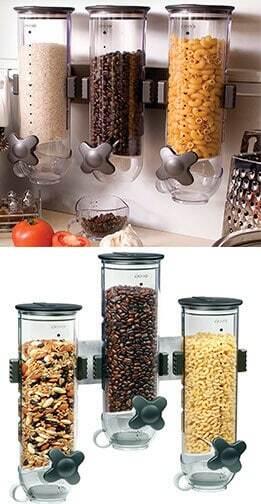 These food dispensers are perfect for cereals, grains, and even coffee. They’re attractive, convenient, and a really effective use of space. Expand the counter-top space that you already have by adding an extra layer to it. A helper shelf gives you the little bit of extra space to stop things looking cluttered. They come in a variety of sizes, and even multipacks. There’s also a special version that fits neatly into a corner. Wine drinkers have no fear, there’s no need to get rid of those extra wine glasses. These racks fit neatly on the underside of a cabinet to make the perfect use of “wasted space”. 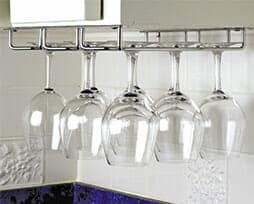 The rack will hold between 6 and 9 glasses (depending on the style), and features an attractive chrome finish. This basket is another great way to make use of space. 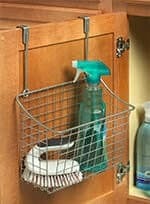 The inside of a cabinet door is an overlooked storage area which this basket makes great use of. It will slide over a cabinet door with no need for tools. It’s made of solid steel and comes in a variety of sizes and finishes. That concludes our post on small kitchen ideas. If you find something that you think would be a worthy addition then please let us know. In fact, if you have any ideas on how to make life in a small space easier then place a comment below or e-mail us. Life in a small space doesn’t have to be any more difficult, and with some clever design and some thinking “outside the box” you don’t have to sacrifice any practicality or convenience. Importantly, none of these ideas are expensive either. While a change in the layout or structure of a kitchen might prove costly, you can achieve the same result at a fraction of the cost using some of these smart pieces of design. Our Facebook page is a great sounding board for new ideas and articles about green living and a more minimalist lifestyle. Just click the link on the right to “Like” our page and stay up to date with all the latest news, gossip, and ideas in the tiny house world. We post interesting articles on a daily basis. If you’re in need of more storage space and especially furniture ideas for your small home then don’t miss our post on this subject.